Dave Grohl and his classic rock band the Foo Fighters came to Lexington, Kentucky back in May, and boy did they get up to some trouble. The lowlife musicians hit the sleepy town like a heinous tornado of vulgar debauchery, and along the way they swept some University of Kentucky soccer players into their devilish ways. Now those despoiled college kids have a debt to society they need to repay. What crimes against morality were committed? Well, The Foos and the Wildcats played some pick-up soccer together, and the NCAA has mandated that several UK players will have to miss two “supervised team activities” as penance for their awful mistake, because there were also coaches present at the pick-up game, during a time in the NCAA calendar when their involvement with players is prohibited. Three current UK men’s soccer players, one former men’s soccer player and one current women’s soccer player participated in the pickup game after being invited to join. 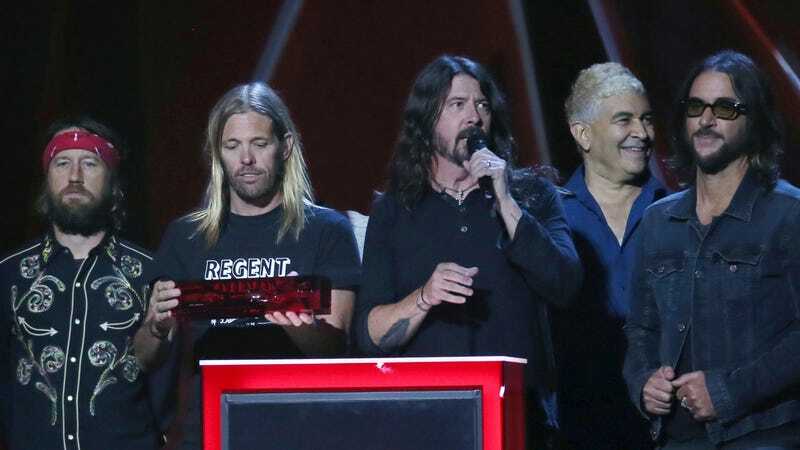 The report does not specify which of the Foo Fighters were playing footy, but pick-up games seem to be a common pastime for the band when they’re on tour. This may seem like the most wholesome rock-star activity possible, but don’t be fooled. Thank God a wise and important institution like the NCAA is around to beat back such corrupting forces.